Ruby Engagement Rings Sydney | Dare to be Different! Ruby Engagement rings – Dare to be Different! Some women are different. For those who dare to be different, ruby engagement rings may be preferred over diamonds. Ruby, with its rich red colour, is considered to be the queen of all stones. It is magnificent and royal. Kings and Emperors always preferred ruby over diamond. As a stone, its virtue equals that of a diamond. Ruby symbolizes the sun – the most powerful form of energy. Its bright red colour shines through. 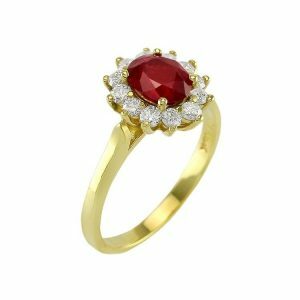 Ruby is generally worn to bring inner peace and drive away all the worries. If you are on a hunt for a coloured gemstone engagement ring then look no further than the ruby! Ruby engagement rings are unique in their colours and cuts. No woman would be disappointed to flaunt a ruby engagement ring instead of a diamond. The rich colour will shine through as a symbol of everlasting love. There are options available for women who want a ruby engagement ring but do not want to leave out diamonds. How about an engagement ring with a vivid red ruby in the centre with two diamonds flanking them? This will definitely prove to be a showstopper and would impress any onlooker. A ruby with its bright colour would contrast beautifully with a diamond to make it look elegant and stylish. Every stone has a special cut. The cut of a stone can make or spoil the look of your precious ring. Oval cut rubies are popular and classy. An oval cut ruby looks superb flanked with diamonds. The exuberance of colour is sure to impress everybody. Oval rubies set among colourless diamonds looks clean and simple. available are an oval cut ruby bezel set solitaire, or you may wish to add to it pavé set diamonds for additional sparkle. Maybe a three stone engagement ring is more to your liking, such as a ruby ring flanked with diamonds. The choices are so many. Putting the customer first, at Raffini Jewellers we customise rings for the special person in your life. A ruby engagement ring could be just the right choice for the most special person in your life. Proposing to ‘her’ with a vibrant ruby band would mean forever lasting love.